Over the past few days New York City and it’s surrounding areas such as New Jersey, Maine and even Canada have been affected by Snowstorm “Nemo“. This blizzard has left a staggering 31.4 inches of snow in Gorham, Maine according to breakingnews.com, caused 4,300 flights to be cancelled which including all those to and from New York City airports, created 200 traffic accidents in Ontario, Canada and tragically claimed the lives of four people in the United States and Canada. To anyone who is affected by this please be careful and take precaution. Here in England it’s another rainy Sunday and no matter where you are there aren’t that many things which beats spending the weekend gaming. Even if you can’t do that currently then there is always next weekend 😉 To some people this may be just another week however cheering things up it’s time to look ahead at the games being released this week. SpellForce 2 Faith in Destiny Scenario 3: Last Stand [Download] by DVG Nordic Games – February 15, 2013. Breaking News (2013) 31.4 inches of snow reported in Gorham, Maine. [online] Available at: http://www.breakingnews.com/item/ahZzfmJyZWFraW5nbmV3cy13d3ctaHJkcg0LEgRTZWVkGODc6QwM/2013/02/09/314-inches-of-snow-reported-in-gorham-maine-twcbreaking [Accessed: 10 Feb 2013]. Huffington Post (2013) Four Killed After Canada And US Hit By Snowstorm ‘Nemo’. [online] Available at: http://www.huffingtonpost.co.uk/2013/02/09/snowstorm-nemo-claims-four-lives-in-us_n_2650934.html [Accessed: 10 Feb 2013]. NY Times (2013) Storm’s Heavy Snow and High Winds Lash at the Northeast. [online] Available at: http://www.nytimes.com/2013/02/09/nyregion/major-snowstorm-arriving-in-northeast.html?hp&_r=1&amp; [Accessed: 10 Feb 2013]. VG Releases (2013) VGReleases.com : February 2013 Release Dates : Video Game. [online] Available at: http://vgreleases.com/ReleaseDates/All.aspx [Accessed: 10 Feb 2013]. It’s a snow day here in the United Kingdom. ‘Yellow’ warning for Central, Tayside & Fife, East Midlands, East of England, Grampian, Highlands & Eilean Siar, London & South East England, North East England, North West England, North West England, Northern Ireland, Northern Ireland, SW Scotland, Lothian Borders, SW Scotland, Lothian Borders, South West England, South West England, Strathclyde, Wales, West Midlands, Yorkshire & Humber. While we understand this does cause distributions for most civilians, here at PwnrsManual we love the snow. Ever since I was a child I’ve loved waking up in the morning’s opening the curtains and seeing the whole garden completely covered in snow. My sister and I would dash outside to make a snowman and have a snowball fight. Then returning to a warm house, drinking hot chcolate and admiring our (what we thought then was perfect) snowman for days. Or, use this time to stay inside, treat yourself to your favourite hot drink (here, it’s a Caramel Mocha) and play your favourite video game, or perhaps the latest addition to your video game collection. While occasionally looking out of the window admiring the snow. Even if you are not in the United Kingdom then why not still treat today as if it is a snow day and play your favourite game. I know I will be spending half my day outside in the snow and half attempting to complete ‘Splinter Cell: Convicition’. The mission has begun. BBC News (2010) Snow . [online] Available at: http://www.bbc.co.uk/news/uk-21073373 [Accessed: 18 Jan 2013]. Gunter, J. 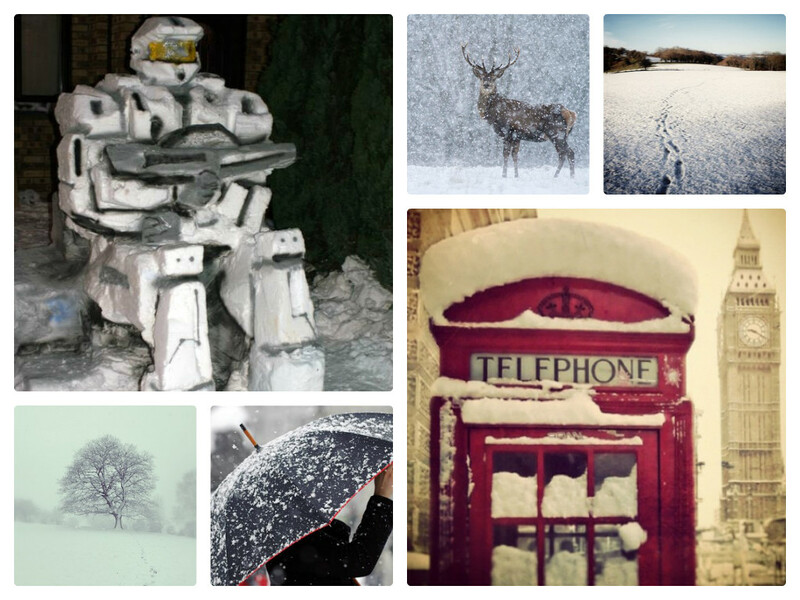 (2013) Britain hit by first wave of snow: live updates – Telegraph. [online] Available at: http://www.telegraph.co.uk/topics/weather/9800068/Britain-hit-by-first-wave-of-snow-live.html [Accessed: 18 Jan 2013]. Halo (2011) Waypoint’s Halo Bulletins. [online] Available at: http://halo.bungie.org/halobulletins/25 [Accessed: 18 Jan 2013]. Met Office (2013) Weather and climate change – Met Office. [online] Available at: http://www.metoffice.gov.uk/ [Accessed: 18 Jan 2013]. Populagram (n.d.) Wales. [online] Available at: http://populagram.appspot.com/tag/Wales [Accessed: 18 Jan 2013]. Tumblr (n.d.) Phone Booth. [online] Available at: http://www.tumblr.com/tagged/phone%20booth?before=114 [Accessed: 18 Jan 2013].